La Moraine is one of the oldest chalets in Val d’Isère, with the traditional extended wall and pillar, which support the whole tree trunks, which support the slabs of granite, which support the twenty feet of snow, which support one of the longest seasons in the Alps.The chalet has, of course, been entirely rebuilt inside. It has a charming sitting-dining room under the rafters, with a wide balcony facing Solaise. This room always seems to generate a very friendly atmosphere, perhaps because of the good food that comes from its state-of-the-art kitchen, perhaps because it isn’t huge and doesn’t have a TV, forcing people to re-invent the ancient art of conversation (though it does have WiFi). Maybe it’s just the unlimited wine. La Moraine is in the little hamlet of Le Joseray, sharing an entrance with our chalet Chez Savoy and opposite Les Gnellets. The lifts, the pistes and the main bus stops are all at most three minutes’ walk away, and you can ski back to within about 100m. Yet the only sound at night is an occasional moo from the neighbours. Lovely conversion of a very old chalet. Excellent living room under rafters, with state-of-the-art kitchen. Wide, sunny balcony with view straight up Solaise. Three single bedrooms so lots of flexibility as to who sleeps where. Good ratio of smart bedrooms. Ground floor flat occasionally used by owners. 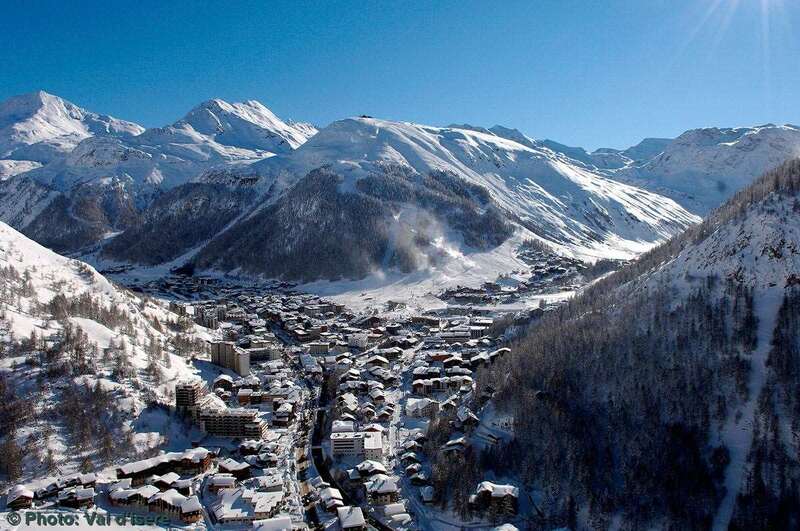 In hamlet of Le Joseray, opposite chalet Les Gnellets, three minutes’ walk from lifts, pistes and bus, six from centre. Due to the proximity to neighbouring chalets, La Moraine is not suitable for loud groups. La Moraine has six pleasant bedrooms: two twins which have views towards Solaise, a double room with its own en-suite washbasin, and three single bedrooms, a rarity in Val d'Isère. Two of these single rooms actually have a large double bed, while the third has a single bed plus a second bed up a ladder. When one party fills the whole chalet, the guests in any or all three of the single rooms can bring an extra person at half price. Twin (12' x 11') on the first floor with balcony. Twin (11'6" x 9'9") next to Bedroom 1 with balcony. Double (11' x 10'4") with unusually large bed, and basin, on the second floor towards the rear of the chalet. Single (9'6" x 8'6") on the second floor, with an extra bed on a mezzanine (8'10" x 8'6"). Single (9'5" x 8'6"). Sweet little room on the first floor, containing a double bed which can be used for two people when one party books the whole chalet. Single (approx 9'6" x 10') on first floor containing a double bed which can be used for two people when one party books the whole chalet. Two bathrooms, one on each floor plus two separate wcs. Additional shower with wc on the second floor. (18'6" x 11'6") On second floor with comfy new sofas at one end, kitchen at the other (not in measurements) and dining table in the middle. Wide balcony. WiFi in places. Rooms 4, 5 and 6 have space for additional people (extra cost).